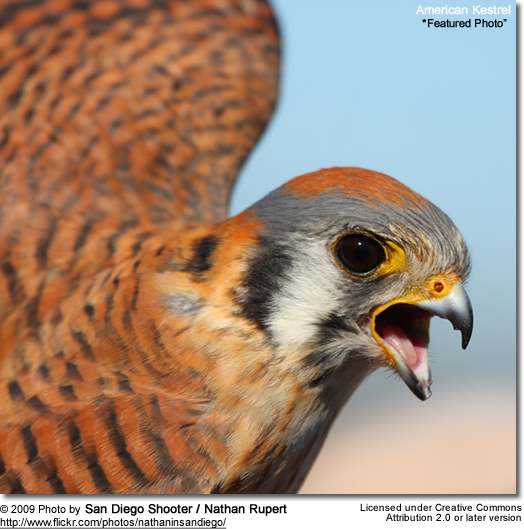 The American Kestrel (formerly known as Sparrow Hawk) is the most numerous and smallest falcon in the Americas. Fully grown male kestrels weigh only about 4 ounces and measure 9 to 12 inches in length. Females are generally larger than males. The males have greyish blue wings, while the females' wings are rust colored. Kestrels are speedy and can fly as fast as 40 mph. They eat small rodents and insects, but also have been known to eat amphibians, snakes and even other birds.